Politics defines economy in the coalition era, at least as far as public expenditure is concerned. 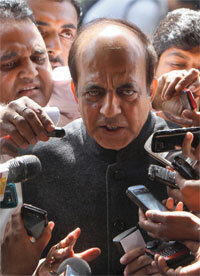 Former railway minister Dinesh Trivedi had to resign even before Parliament approved his budget. Reason: his proposed hike in passenger fares. But his expenditure proposal was not censured. This is just one instance. In the past eight years, the UPA government has withdrawn 20 revenue decisions under pressure from coalition partners. On the other hand, its allies have forced it to take major expenditure decisions, like the flagship programmes. Is there a method coalition governments follow to calculate social expenditure ? The current debate over economy versus politics in a coalition era has interpreted this in a clinical manner. It paints the impact of coalition government on economic decisions as entirely negative. Coalition government appeared at the state level in 1967 and at the Centre in 1977. After 45 years, coalition is a natural political choice, making access to power conditional to more than one party’s interests. India has long accepted the political compulsions behind economic decisions. How do such multiple interests and ideologies within a government influence its economic decisions? There seems to be decisive impact on government’s expenditure—both current and capital—decisions. A series of studies on the subject points out both positive and negative impacts on expenditure decisions. In fact, the studies find more positive than negative impacts from the perspective of the aam admi. In essence, most of these studies have concluded that the rise of coalition governments has been one of the major drivers for increasing public spending at the state level. The National Institute of Public Finance and Policy has studied whether the size and composition of public expenditure are related to government-specific political characteristics. The analysis covered fiscal decisions of 14 states in 27 years. The states account for 85 per cent of GDP and total population. The study is relevant since it covers governments during a period, 1980-81 to 2006-07, of consolidation of coalition government. During this period, coalition governments ruled in 32 per cent of the total 366 fiscal years. The study found that a coalition form of government is good for public expenditure. An additional party in a government as coalition partner leads to 2.5 per cent increase in public expenditure. Interestingly, the analysis says weak opposition leads to less public expenditure. Average per capita capital expenditure of states decreases by one per cent with the inclusion of an additional party in the opposition, the study says. Coalition government is suitable for encouraging more capital expenditure. In fact, the more the number of partners in a coalition government, the more is the percentage of capital expenditure. With every percentage increase in support to the government, the expenditure rises by 0.1 per cent. According to the study, “ideology” is the less defining aspect in a coalition era. Rather it says, a government that is staunch in ideology will incur less capital expenditure. “One of the possible reasons for its insignificance could be that in the era of coalition governments and competitive politics, the governments do not treat the electoral cycle years different from the normal ones,” the study says. There have been a few other studies that looked at composition of a coalition and spending on specific sectors. A study by University of Massachusetts Dartmouth published in February found that spending on irrigation increases if a coalition partner is a regional party. In coalition governments, education spending is usually high. “Because of clear increasing returns to education in a liberalised economy, demand for increased resources devoted to it makes sense from the voters’ point of view,” argues the study. In 2005, Mala Lalvani of University of Mumbai published a similar analysis based on 27 coalition governments in 14 states during 1980-1999. It found that coalition government favours capital expenditure on social services. The impact on revenue expenditures was also positive. This means that coalition governments raise the per capita state domestic product. This is contrary to current popular fear that coalition compulsions will slow economic reforms, and therefore stunt economic growth.